The artist draws with a needle on to a copper, zinc or steel plate that has been covered with an acid resistant wax. When the plate is immersed in acid, the bare metal, exposed by the lines of the drawing, is eroded. The depth of the `etch’ is controlled by the amount of time the acid is allowed to `bite’ the metal. The longer in acid, the deeper the line and the darker it will print. Inorder to obtain a print, a viscous greasy ink is pushed intothe etched grooves, then the surface is wiped clean with muslin, leaving only the etched areas retaining ink. The actual impression is made with a copper plate press which is similar to an old washing mangle with a large plank or `bed’ between the rollers. The plate is placed on the bed, covered with dampened paper and backed with three or four felt blankets. These are then passed through the press under high pressure, the malleable paper is forced into the cuts and ridges in the plate and thus picks up the ink. When the paper is finally peeled off, it reveals a faithful mirror image of the etched drawing. This inking procedure is then repeated for each print. When the etching is complete a limited number of prints are made. Then using a pencil the artist signs each print with the title, a signature and a fraction showing its position in the edition. For example 25/100 is the twenty fifth print out of an edition of one hundred. The artist is also allowed to make an extra 10% for personal use. Therefore, in an edition of one hundred, one hundred and ten prints are made. The extra ten are marked A/P (artists proof) instead of the fraction. They are valued above numbered prints by collectors because of their association with the artist. Finally, the plate is cancelled by scratching a line through the image. A print made from a scratched plate is called a ‘cancellation print’. It ensures that further prints cannot be made and the numbered impression can be trusted. Original’ prints are images made by the artist from beginning to end directly in or on the plate, stone, wood block & other matrix. Each print is a work of art, one of a limited edition and signed by the artist. The photo mechanical reproduction of paintings and drawings are often described as ‘Fine Art Prints’ but this term is misleading as they are not works of art, even if they have an artist’s signature. 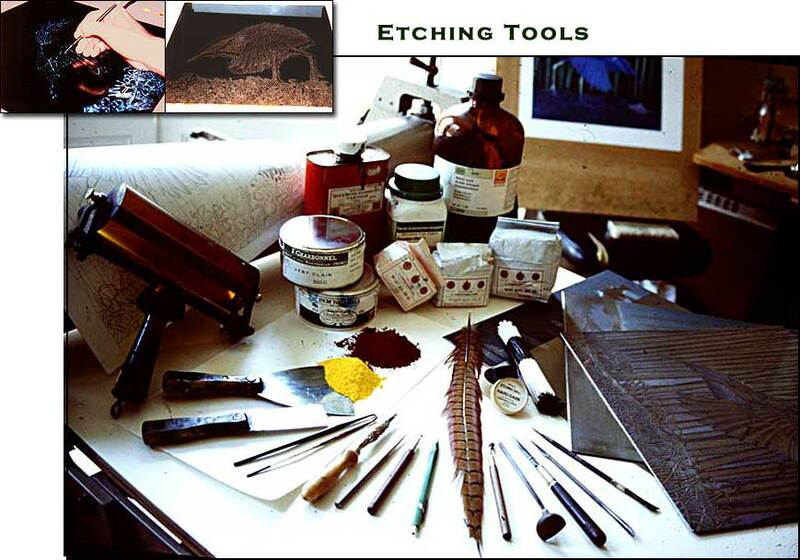 Colour etchings are obtained by making two, three or in some cases five plates, each holding different elements of the image and inked in a number of colours. The paper is passed backwards and forwards through the press, each time with a different plate. Sometimes when the print is dry, a little hand tinting with water colour is necessary to complete the image. All the plates are worked and re-worked. Some areas are adjusted or remove and prints or `proofs’ are made to test the progress at different stages before the final image is arrived at. I begin printing the edition. From inking up the plates to pulling the print takes about forty five minutes. Therefore, great care has to be taken with the inking procedure. The plate holding the areas of the reeds and fish is inked with two colours, green and purple. The next plate to be inked also holds two colours blue for the bird and green-blue for the water. The key plate is inked with one colour, sepia. The reeds and fish are printed first. Then the paper is peeled away keeping one end trapped under the roller. The plate is removed and replaced, within the registration marks, with the second plate. Which holds the colours for the bird and water. The key plate is printed last because it holds all the drawing details and ties the image together. It also creates extra colour values by virtue of overprinting. When all five colours have been printed the image is placed between sheets of acid free tissue and blotting paper for two or three days allowing it to dry flat. Finally the sky is hand-tinted with yellow water colour, the legs of the bird being tinted orange.